Is the Zero Waste movement sustainable and will it be integral to our future? 29 Jan Is the Zero Waste movement sustainable and will it be integral to our future? Guest blog written by Amy from A Conscious Traveller. ‘Zero-waste’ was a term initially used in manufacturing where the companies squandered as little resources as possible. Since then, it has become a catchphrase used by individuals globally to denote sending nothing to landfill. However, is this movement just a phase? A way for people to become environmentally conscious for a while and then just give up, moving onto the next bandwagon? This article will discuss whether the zero waste movement is sustainable and whether or not our future will demand it. The movement is currently growing due to several factors. Firstly, there has been increased publicity about the volume of rubbish, specifically plastics, that people create. Single-use plastics and disposables have become an increasing convenience since the end of WWII and this, combined with a growing population, has led to millions of households relying on disposables for every convenience. By way of example, where before reusable kitchen towels or cloths were used, now, disposable wipes or paper towels have replaced them, or using reusable Tupperware or cloth to pack a lunch has now become wrapping food in cling-film. This, especially on such a large scale, has resulted in gigatonnes of rubbish being disposed of and ending up in landfill. Secondly, people are becoming more environmentally aware and frustrated about the environmental degradation that humans are causing and are demanding better. This has not only led to insisting companies and stores reduce their plastic usage and waste, but also demanding more from themselves in a bid to, at least, control or reduce what their wasteful habits, if they cannot change the world. This is, in fact, the sense of helplessness that led Bea Johnson, dubbed the “Mother of the zero waste lifestyle movement” by CNN, to begin living a zero waste life with her family of four. By questioning companies’ policies, boycotting those that they do not believe in, consumers have the power to evoke change within industries: after all, without consumers, the companies will not have any sales. Additionally, the fear of global warming, along with the shock of the recent IPCC reports’ declaration that the world has ten years in which to reverse global warming, has been a drastic wake up call for many. The response has been encouraging, although arguably not large enough, as individuals are beginning to take action for themselves, reducing their physical waste and carbon footprint. However, even in today’s world, where not everyone is living a zero waste life, there are significant problems with zero-waste. If the term is taken at its face value, and by this I mean literally making no waste at all, this is, in my opinion, virtually impossible for humans without reversing societal development. Waste is an aspect of our everyday lives: we shower and brush our teeth, wasting water if it is not reused as grey water; we travel to work, by car or public transport, using energy that is released without being captured and reused, creating waste; our daily meals have air or travel miles from their growing destination to the supermarket and then to your home, contributing to both their and your carbon footprint; need I go on? Buying “from bulk” is great: you can take as much or as little as you want from the containers and take it home with you in your reusable bag. However, even though the individual is not creating waste, there will inevitably be some form of wastage along the line, whether that’s in the form of the bags used to transport the dry food, or the plastic containers for the liquids. Although it is definitely better to buy from bulk, minimising the amount of packaging consumed, and the containers are largely reused, it is still arguably not ‘zero-waste’. Additionally, the movement has been seen as being elitist. Whilst in many cases shopping from bulk can save you money as you do not buy what you do not need and are not paying for the packaging, it can sometimes be more expensive, especially if the products sold are organic. 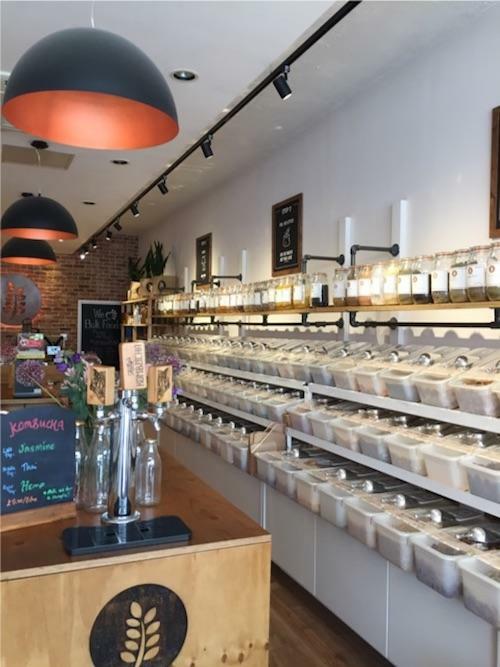 Furthermore, some people with poor or no access to bulk stores can find achieving zero-waste difficult. Whilst there are ways in which the consumer can decrease their plastic use without a bulk store, such as buying vegetables loose and ingredients in paper packaging, poor access makes it difficult to instigate wide spread change. An example of a bulk store. So is there a future for the zero-waste movement? Personally, I believe that yes, there definitely is. This is evident with large companies already declaring they will implement changes in both their policies and their products, such as Unilever’s recent announcement that they have “joined the waste-free shopping platform Loop”, and British supermarket brand Iceland revealing plans for a plastic-free aisle. This is encouraging as it shows that companies are becoming more aware of the need for environmental protection, as well as listening to consumer’s demands. However, as Greenpeace has revealed, by 2050 there could be more plastic than fish in the oceans. This is considerably worrying as not only is fish a main source of protein for many people’s diets, but it is also a form of trade and thus economic development for communities that rely on fishing. The plastic in the oceans will pollute the physical environment, both aesthetically and disrupting ecosystems, and humans will then unwittingly pollute themselves when they eat the fish, who may have ingested plastic mistaking it for food, and through drinking water. As a result, it is necessary for individuals and companies to continue and improve efforts in the reduction of waste. Despite this, as with everything, difficulties will be encountered. It will be difficult to instigate far-reaching changes to the daily lives of many and will, in my opinion, require a three-pronged approach: consumers, companies and legislation will be needed in order to ensure and encourage its success. It will be difficult to achieve this at the necessary speed, although in many developed countries it may be easier than those that are less developed, where the primary need is to focus on bringing populations out of poverty. Implementing changes does not need to be costly, but will require a change in expectations and lifestyles, from everyone. Furthermore, energy changes will need to be considered: it is all well and good reducing the volume of goods being sent to the landfill and being produced, but changing energy from non-renewable to renewable is also necessary and will be costly as it involves the implementation of new schemes and technology, such as building windmills. Within the future of zero-waste, I believe it is important to consider the future of transport. The world is becoming increasingly globalised and interconnected, which is, without a doubt a great thing: it encourages the spread of ideas, norms and people. However, whilst technology and the internet are facilitating the ease at which people can work at home and have video-conference calls rather than travelling to distant places, people are becoming more mobile and cheaper flights are making it far easier for people to travel more and to farther destinations. The ability to move is great, but changes will be needed to make these more sustainable. This is especially necessary in regards to flying. Whilst trains and cars can run at high speeds using electricity and some train journeys are faster than flying, air transport is still necessary to get to different countries and, although I’m not a scientist, I do not think electricity can currently power planes. Hopefully, in the future someone will develop a zero-carbon emissions aircraft that can carry the same number of people as a commercial jet, but presently, I believe it will be a considerable problem in the obtention of becoming a zero-waste world. 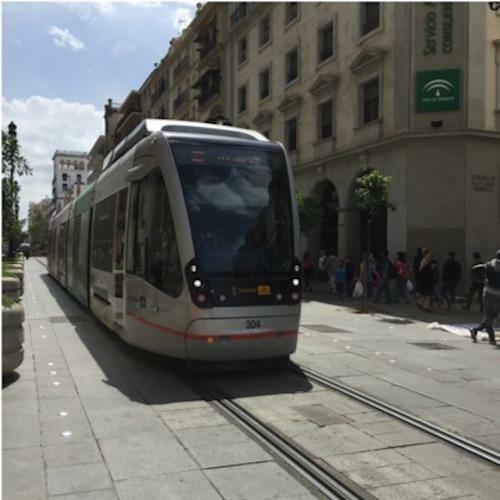 A widely used tram in Sevilla, Spain, powered by electricity. Overall, I can definitely see a future in which we, as a global community, drastically reduce our waste. I think, however, that it will be difficult to get this down to ‘zero’, especially in terms of energy wastage. By encouraging a circular economy, where resources are reused indefinitely, as opposed to a linear economy, minimal wastage could be achieved, yet this would require widespread action, from consumers, governments and companies. But I am encouraged by the strength of the movement and believe that individuals can provoke great change and that, yes, this movement will play an integral part in the world’s future. Amy in her local zero waste. 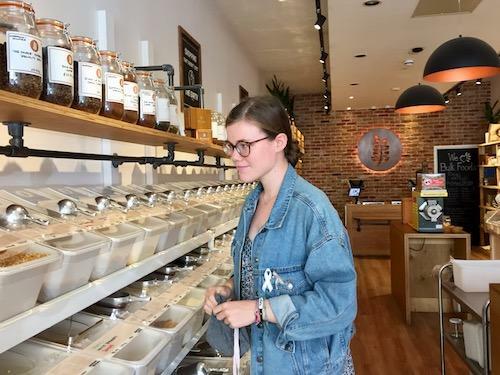 Writer bio - Amy is a student who is fascinated with ways in which people can live and travel more sustainably, as well as the concept of zero waste. She tries her best to live whilst creating both little plastic and waste. Her blog, Instagram and newly released YouTube all promote simple swaps people can make to lessen their environmental impact, especially whilst travelling.